This is adapted from a Mark Bitmann recipe in the New York Times. The key is to use Spanish paprika or as it is called in Spanish, “pimenton”. Whole Foods carries a good selection, 3 different varieties of Safinter Smoked Spanish Paprika. I use the “Bittersweet” variety. 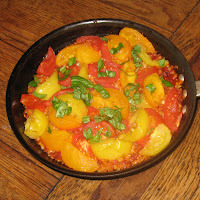 This dish is particularly spectacular when done with a variety of tomatoes of different colors. 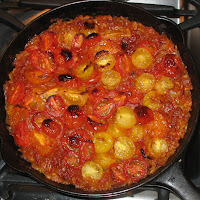 This is also excellent made with a variety of cherry tomatoes. I have done this about an hour ahead to the step: “put pan in oven” which you may want to do if you are making this for company. Let simmer until it is mostly absorbed, then add the hot water and stir until just combined. Put tomato wedges on top* of rice and drizzle with juices that accumulated in bottom of bowl. Put pan in oven and roast, undisturbed, for 15 minutes. Check to see if rice is dry and just tender. If not, return pan to oven for another 5 to 10 minutes. If rice looks too dry but still is not quite done, add a small amount of water. When rice is ready, turn off oven and let pan sit for 5 to 15 minutes. Remove the pan from oven and sprinkle with parsley and basil. [I usually just use basil]. If you like, put pan over high heat for a few minutes to develop a bit of a bottom crust before serving. 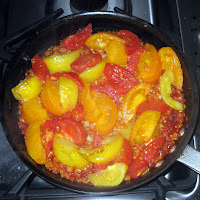 *VARIATION: I don't like the tomatoes overly cooked so I often add the tomatoes, especially if using cherry tomatoes, after the first 15 minutes of cooking. VARIATION: Since tomato and corn season coincide, I often add an ear's worth of corn, sliced from the cob, to the rice mixture, after the first 15 minutes of cooking then add the tomatoes per the above VARIATION. August 2017: Everytime I make this, I want to take a photo! Did last night and it shows tomatoes that were cooked about 7 minutes, just enough to be warm. Topped with chooped basil it made a perfect late summer dinner. Enough leftover to have with crusty bread for lunch today.